This Month at Playworks… Throughout April, Playworks will focus on childhood development and the well-being of children. This month, we will celebrate Week of the Young Child from April 8-12, while also raising awareness to help recognize childhood abuse and neglect throughout National Child Abuse Prevention Month. Children are the future and ensuring that they are learning, developing, and being cared for properly is of the utmost importance. At Playworks, we strive to provide child care that goes above and beyond for the many families that we serve. We are thankful that you and your child are part of our Playworks family. Please join us for events and giveaways throughout April for Week of the Young Child and National Child Abuse Prevention Month, which you can learn more about on page 4 and to the right. Playworks conferences will take place this April! Hello, Toes Goodbye, Toes For this month’s Conscious Discipline activity, we encourage you to play this fun game with your child when they take off and put on their shoes and socks. Once your child’s shoes and socks are off, bring one of their feet close to your face and say, “Hello, toes!” Look at the toes, blow on them, count them, touch them, or even nibble at them. Quickly say, “Goodbye, toes!” and hide the toes from your sight. Say, “Where did those toes go? I just had them in my hand and now I’ve lost them. Oh dear, what will I do? Maybe I put them here.” Search for the feet all over the child. This game can also be played with hands, knees, elbows, shoulders, or other body parts. In honor of Child Abuse Prevention Month, Playworks will be hosting events and giveaways throughout April. National Child Abuse Prevention Month’s purpose is to recognize and prevent child abuse and neglect, and Playworks encourages all families to work together to bring attention to this extremely important topic. the opportunity to become more aware of the world around them. Children will learn to observe, gather data, and propose solutions to problems. 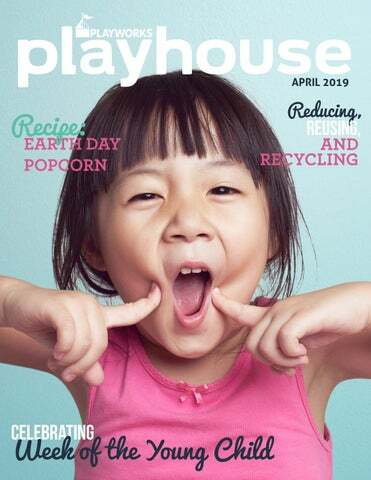 This month’s topic will also provide students with information that will encourage them to be good stewards of the earth throughout their lives. While the early learning classrooms discuss reducing, reusing, and recycling, the infant and toddler classrooms will study food. Students will learn about preparing and tasting food, and they will have the opportunity to develop their social-emotional, physical, cognitive, and language skills. When you’re cooking this month, encourage your child to help you in the kitchen, then show them how boxes, cans, and bottles can be recycled throughout the cooking process. Celebrate young learners throughout Week of the Young Child! The second week of April will play host to five fun-filled days at Playworks, with different activities taking place throughout the week. This year’s Week of the Young Child will explore five themes—music, food, teamwork, art, and family. Learn how these themes can encourage your child’s development below! Singing, dancing, and listening to music helps children develop language skills and encourages them to be active. Cooking uses and encourages math, literacy, and science skills, while eating healthy foods encourages fitness and nutrition. Creating art fosters fine motor skills and creativity, especially when working on open-ended projects. Working together helps children develop their communication and social skills, as well as their imaginations. Family is a child’s first teacher and the heart of a young learner’s support system. Playworks Staff Spotlight: Anh Hudspeth How long have you worked at Playworks? What is your position at Playworks? Number Concepts and Operations Counting is an extremely important skill for children to learn. Numbers are the foundation of mathematics, and learning to count is one of the first steps a child takes on their journey of understanding math. See what this skill looks like and how you can support your child’s development below! Pop up this candied, colorful popcorn on Monday, April 22, in honor of Earth Day! Help your kids understand the importance of taking care of the earth while enjoying this easy, earth-themed snack. 1. Preheat oven to 350Ë&#x161;F. 2. Line two baking sheets with parchment paper. 3. In a large bowl, mix 2 tablespoons of agave nectar with a few drops of the blue food coloring. 4. Add half of your popped popcorn to the bowl and gently toss or stir to combine. 5. Pour the popcorn onto one of your prepared baking sheets. 6. Repeat the process with the remaining popcorn, agave nectar, and green food coloring. 7. Place both pans in the oven and bake for 5-7 minutes. 8. Remove, let cool, combine, and enjoy! TASTING AND PREPARING FOOD Throughout April, Playworks infants, toddlers, and young preschoolers will be tasting and preparing food, while strengthening their social-emotional, physical, cognitive, and language skills. They will also develop other personal care skills, such as washing their hands, serving themselves, and cleaning up after themselves. See below how children learn through tasting and preparing food! Children will learn about themselves and others. Children will learn about the world. Infants are eager to practice the skills that enable them to feed themselves. Toddlers learn how to work cooperatively with others in preparing simple foods. Children build a foundation for mathematical thinking when they sort fruit by color and fill a pitcher with cups of water. They learn problem-solving skills when they fill a muffin tin only halfway so the batter does not overflow when baking. Children will learn about moving. Children strengthen their small muscles through activities like tearing lettuce for a salad or scrubbing vegetables. They coordinate their hand-eye movements when they pour water into a cup or spread apple butter on a cracker. Children will learn to communicate. Children learn vocabulary associated with cooking when they knead dough, chop pieces of fruit, or stir pancake batter. Enjoy the work of hundreds of the nation’s finest artists and crafters at the Spring Festival: An Arts and Crafts Affair at Canterbury Park. The event will feature hourly gift certificate drawings, food and drink, free parking, and plenty of family fun. Join Playworks for the Xtreme Summer Camp Open House and Orientation on April 22. Summer campers will meet their teachers, go over a calendar of events, sign field trip permission forms, and participate in a fun scavenger hunt. Questions about Summer Camp? Contact Educare/ Enrollment Manager Shannon Zila at 952.496.6803 or shannon.zila@playworksfun.com. sizes, and high-quality water We offer custom labeling, purified a variety of to make your next special event sizes, and sure high-quality purified water to sure your one. next special event is make a memorable is a memorable one. THE We offer custom labeling, a variety of THE We offer custompurified labeling, awater variety of sizes, and high-quality IN sizes, and high-quality purified water to make sure your THE next special event to make sure your next special event INone. We labeling, a variety of is a memorable THE offer custom is a memorable one. says recycling can’t be fun? Craft: Plastic Bottle Piggy Banks Who Transform an empty plastic bottle into an enjoyable way to save up your spare change! Before you begin, make sure the bottle is empty and dry and labels are removed. With an adult’s help, cut a coin-sized opening about mid-way down on one side of the bottle. Decorate your piggy bank with construction paper or googly eyes. Be creative—give it ears, eyes, or a tail! 4. For feet, glue four pom-poms on the opposite side of the bottle as the coin opening. 5. Start saving your coins and make your first piggy bank deposit! restrictions apply. visit playworksfun.com for more information.